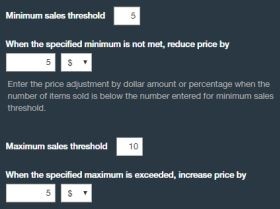 Attempts to price items to capture a target number of units sold within a range and a designated time period (minimum of 1 hour). Recommended for private label sellers or items that do not have any competitors. This strategy will give you amazing control over your price point and is the most “seller customized” strategy provided you set all parameters based on sales and not any competition.